Imagination. Energy. Intellect. Agility. These are the traits of great policy leaders — and of the doctoral students, faculty, and supporters who make up the Pardee RAND Graduate School. For more than four decades, Pardee RAND has provided a unique educational experience. The curriculum is renowned for its rigor and breadth. And Pardee RAND's location at the RAND Corporation's headquarters campus offers unparalleled access to world-class policy experts and experience. Every day at Pardee RAND, students are called upon to be the answer to the challenges they see around them. 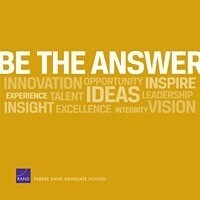 Help shape the future of public policy and support the Pardee RAND Graduate School. Be the Answer. Santa Monica, CA: RAND Corporation, 2011. https://www.rand.org/pubs/corporate_pubs/CP630-2011-09.html.